In this 2014 photo, TV talk show host Wendy Williams arrives during the Soul Train Awards in Las Vegas. Williams is taking three weeks off on doctor’s orders. She said told her audience Wednesday that her doctor told her to take the break to deal with her Grave’s Disease and hyperthyroidism. 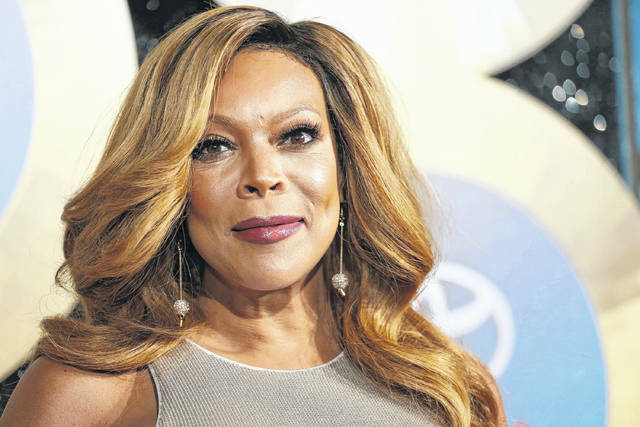 NEW YORK — Daytime talk show host Wendy Williams says she’s taking three weeks off on doctor’s orders. Williams says that her doctor told her to take the break to deal with her Graves’ Disease and hyperthyroidism. Reruns will air in her absence. Williams told her audience Wednesday that she’s been feeling like there are birds flying around her head, like a cartoon, and discussed other symptoms. She urged women in her audience not to neglect their health and to get regular check-ups. The talk show host is 53 and recently lost 50 pounds. NEW YORK — Fourth months before “Jurassic World: Fallen Kingdom” hits theaters, Universal Pictures has announced plans Wednesday for a third installment in the rebooted dinosaur franchise. “Jurassic World” ranks among the biggest box-office hits. It launched with a $208.8 million opening weekend and finished with $1.7 billion worldwide in ticket sales. Trevorrow and Steven Spielberg are executive producing each new “Jurassic World” film. Directed by J.A. Bayona, “Jurassic World: Fallen Kingdom,” starring Chris Pratt and Bryce Dallas Howard, opens June 22. LOS ANGELES — Jaden Smith’s environmental consciousness was born when he was out surfing at about age 10. He saw plastic water bottles bobbing in the ocean beside him, and he was so upset by it that he told his parents. Then he learned in school about the Great Pacific Garbage Patch, those floating “islands” of garbage and plastic debris, and insisted that his family do something about it. The result is Just, an eco-friendly bottled water company founded by Smith and his famous dad, Will Smith. The company makes its packaging from almost entirely renewable resources, including “plastic” derived from sugarcane. “This was a company born out of a child’s love for the ocean,” Will Smith told The Associated Press during an interview with the father-son entertainment duo about their company’s new offering: flavored water. They established the company in 2015, but the elder Smith said he wanted to wait until it gained momentum on its own merits before revealing the brand had celebrity backing. LOS ANGELES — Wonder Woman and Luke Skywalker will be at the Academy Awards — or at least the actors who play them onscreen. Oscar producers announced Wednesday that Gal Gadot and Mark Hamill will appear on the show, along with fellow “Star Wars” actors Oscar Isaac and Kelly Marie Tran. Producers say Lin-Manuel Miranda, Gina Rodriguez, Armie Hammer and Zendaya also have been booked as presenters. Previously announced stars appearing on the March 4 telecast include “Black Panther” Chadwick Boseman, comedian Tiffany Haddish, “Spider Man” Tom Holland and Margot Robbie. Jimmy Kimmel is hosting the show, which will be broadcast at 8 p.m. Eastern on ABC.